Avoid costly repairs to your home or business by making some simple changes to how you dispose of kitchen and bathroom waste. Use strainers in the sink to collect food particles. Please only flush the three Ps – pee, poo and paper. 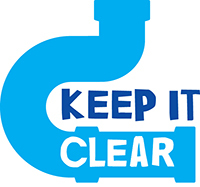 Domestic waste pipes are typically just 4 inches wide and even bathroom products that claim to be flushable (like wet wipes) should be thrown in the bin instead. 0330 303 0368 (calls charged at local rate). We will try our best to establish if the problem is in a public or private pipe. After October 1 2011, certain sewer pipes became our responsibility. We've produced short films to explain what's changed. Sometimes we'll be able to determine that the problem is in a private drain. If so, you'll need to contact a drainage company who can resolve the problem. If we can't tell over the phone where the problem is located, we will visit the customer's home to investigate. If the blockage is in a private drain we'll attempt to clear it – providing that it can be achieved reasonably quickly. We'll ask you to sign a consent form to allow us to work on your private drain.